Lui Keung Aquarium was established as early as 1955, an aquarium with the longest history in Hong Kong. The perfect diet for all smaller marine fish providing all the nutrition they can handle. Full of essential fatty acids DHA and EPA, high quality animal proteins, necessary vitamins and minerals this diet helps improve immunity to disease brought about by stress associated with life in an enclosed marine environment. Allows your marine fish to quickly acclimate to their new environment by establishing proper metabolism while working to keep their digestive system resistant to bacterial and fungal infections. Offers improved growth rates and superb coloration. Have your new arrivals looking like they just came off the reef! The slowly sinking, soft pellet allows fish at all levels of the aquarium ready access to its nutrition. 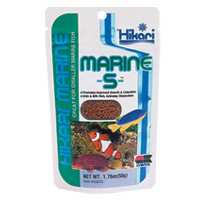 Best of all, Hikari Tropical Marine-S will not cloud the water. Feed no more than your pet will consume within two minutes two to three times each day based on size. Care should be taken to avoid over-feeding and always remove uneaten food after feeding period. Copyright © 2019 LUI KEUNG AQUARIUM LIMITED.